Donald Trump’s surprise U.S. presidential election victory promises to result in an overhaul of U.S. trade policy, including the immediate end of support for the Trans Pacific Partnership, the controversial trade pact involving 12 Pacific countries including Canada, the U.S., and Japan. While President Barack Obama held out hope that the TPP could be salvaged during the “lame duck session” of Congress that occurs immediately after the election, his administration was quickly forced to concede that the deal has become politically toxic and stands no chance of passage. Since U.S. ratification is required for it to take effect, it’s effectively dead. My Globe and Mail column notes that the Canadian government’s view of the TPP was always difficult to discern. 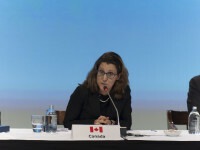 It was negotiated by the previous Conservative government, but Prime Minister Justin Trudeau and International Trade Minister Chrystia Freeland have been non-committal, focusing instead on TPP public consultations that are still scheduled to run until early 2017. Their ambivalence was not a function of trade skepticism – the Liberals emerged as enthusiastic backers of the trade deal between Canada and the European Union – but rather stems from the recognition that Canadian interests in the TPP were largely defensive in nature. With agreements already in place with many TPP countries, the agreement offered at best limited benefits for Canada’s economy.